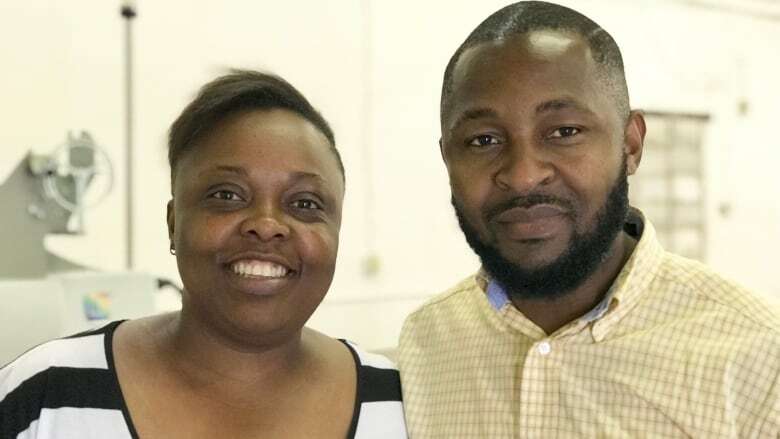 Husband-and-wife team Thierry Kouembi and Marlyse Tchuigoua know what it’s like to be newcomers to Canada. ​Husband and wife team Thierry Kouembi and Marlyse Tchuigoua know what it's like to be newcomers to Canada. They arrived in Calgary in 2015 from Italy with big dreams to bring Milan-quality fashion design and manufacturing to Alberta. Tchuigoua spent seven years as a pattern designer with the world-famous brand Dolce & Gabbana, following stints with other big names in Italy over 12 years after the couple moved there from Cameroon. 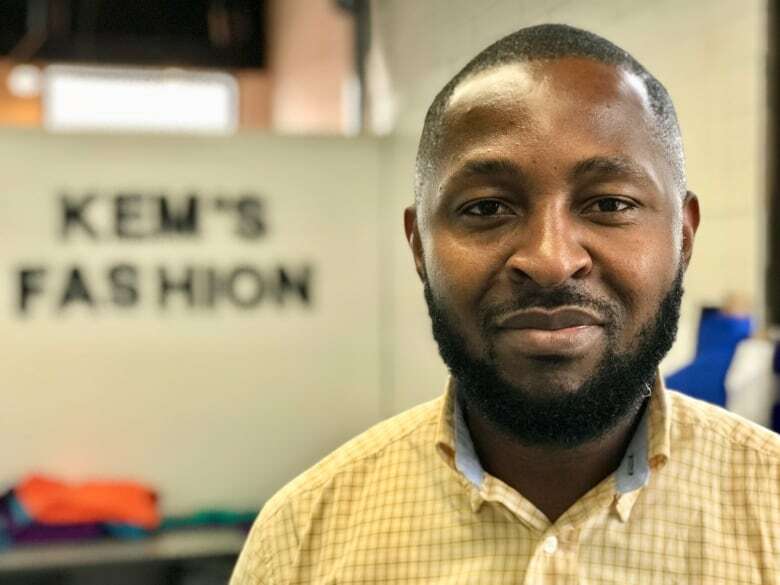 "We decided it would be nice to come here and have our own manufacturing business," said Kouembi, who has also spent his life around clothes and fashion, working in fabric manufacturing himself as a student and being the son of a seamstress. The couple started small, working out of a room in their Calgary home, taking on all kinds of alterations and custom sewing jobs before deciding to take their dream to the next level. They did so with help from organizations like the Francophone Economic Development Council for Alberta and Futurpreneur Canada, a non-profit that provides financing and mentoring for entrepreneurs. "We did a small business plan, and after a collaboration with Futurpreneur, we got a loan of $25,000," said Kouembi. From that, Kem's Fashion — named after the couple's son, Kemi — was born. 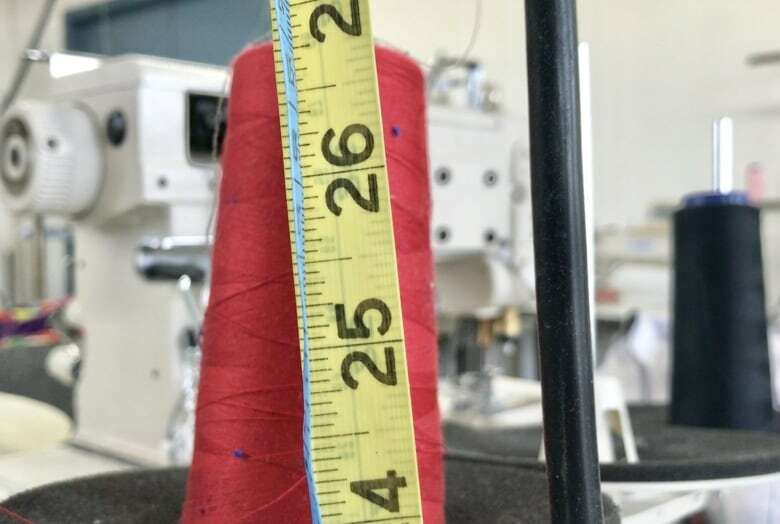 It offered pattern making and custom fashion for businesses and local designers, providing cutting, sewing and finishing work from a small upstairs room in a northeast business unit. The loan helped buy modern professional sewing machines and other equipment. The couple got to work, even putting together their own collection to show at the 2017 Alberta Fashion Week in Edmonton. The company now does work for local designers and companies like Finn & Grin, Sem, Paige1912, Anthology 35 and Via and Jax, making women's and children's clothing, scarves, underwear and other products, including corporate wear and even pet products. Behind the sewing machines sits a team of four Syrian refugees with the mastery of skills essential to a quality-conscious business like Kem's. "We have been really fortunate to have a Syrian population here who recently came to Calgary," said Kouembi. "We decided to talk to different agencies and social services to see if it was possible to have some people work, and the Syrians were really perfect on their jobs," he said. Even his experienced and hyper-critical wife was blown away by the Syrians' skills and quality of work. "They start at age eight and now they are 30 or 32 and they are professional. They like their job and they need these jobs for their families because all of them have children and wives," said Tchuigoua. "I hope we have a big market in order to give them a good contract and contribute to the Calgary and Alberta economies," she said. Right now, the employees work part-time, but the couple hopes to land enough work soon to increase their hours to full-time positions. "They have experience in this field and it's important to allow them to have a really fair wage for what they are doing. They started doing it in their childhood, and we think with them we are able to do something great because of their expertise in this field," said Kouembi. The business is doing so well they are just about to move nearby to a much bigger space in the industrial northeast, complete with their own cutting machine and places to store fabric and other equipment. "I'm very, very excited because it's not easy and I have to face many challenges, like English language, and I'm very, very busy," said Tchuigoua, who is also a mother to three children, ages six, four and one. If the province continues to support made-in-Canada, local business and sustainable products, Kouembi says his business and the fashion industry in Calgary will be able to grow into something special. "It supports creativity, local fashion designers and entrepreneurs," said Kouembi. MLA Karen McPherson says she'll be including the story of Kem's Fashion into a bill she's working on. "The downturn has affected a lot of people. 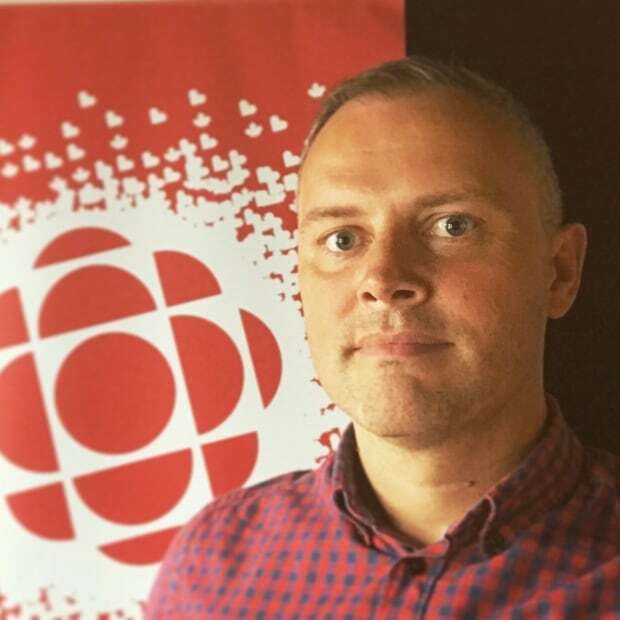 So to hear about an employer like this who's really specific about getting people who have the right skill sets and making sure there are jobs for people that might be struggling to find jobs otherwise, is really heartening," said McPherson, the MLA for Calgary-Mackay-Nose Hill. "They're looking at bringing interns in from different schools," she added. "It's a positive for other businesses in the city and in the province." 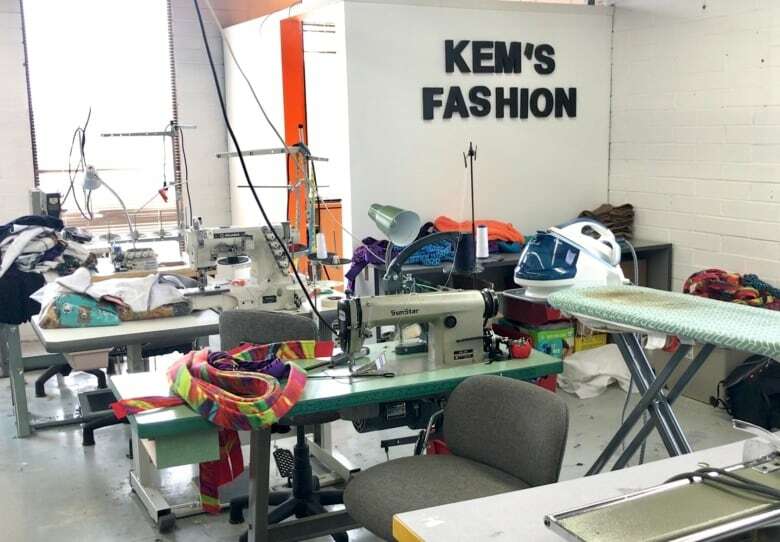 Kem's Fashion will spend the summer moving into its new building. The couple says they hope to employ another two Syrians this year, bringing their team up to eight workers.